The bank has said no action will be taken "this side of Christmas"
Conservative leader David Cameron says nationalising troubled bank Northern Rock would be "a monumental failure". He spoke out after acting Liberal Democrat leader Vincent Cable called for urgent legislation to put the bank into public ownership. Mr Cable is asking Gordon Brown to introduce a Bill before Christmas to permit nationalisation of the bank. He said the firm was "bleeding to death" and public ownership would provide much-needed stability. But Mr Cameron said he opposed the move. "I don't support nationalisation," he told BBC Radio 4's Today programme. "I don't think it would be right for the government to spend even more taxpayers' money nationalising a bank and suddenly becoming responsible for £100bn of mortgage lending. "What I want is a private sale, but I suspect that the government is running out of time and running out of money and it may well be that they have to go down the path of nationalising. "If it does, it will be a monumental failure." The Newcastle-based bank was struck by the credit crisis over the summer and is borrowing money from the Bank of England, which has lent it about £25bn. Mr Cable told the BBC that nationalisation was the "least worst answer" to the bank's problems. He said he was not making the calls "for political reasons", adding that "he understood that people in the Treasury and Bank of England are already preparing for public ownership". He said efforts to sell to a private buyer were not succeeding and that temporary measures needed to be taken to secure taxpayers' money. "The consortiums that are involved are struggling to raise the vast amount of money that's needed and we are talking here about raising £30bn - roughly the size of the current defence budget - in order to repay the taxpayers' loan." Temporary public ownership would enable the bank to secure a period of stability, he said. "At the moment it's bleeding to death - approximately £3bn two weeks ago and £1.5bn last week had to be put in additionally. "Once the bank is under temporary public ownership - I stress it's temporary, not a permanent solution - it enables the banks to be reassured who are lending that there's an absolute sovereign guarantee, and it provides a period of stability." Mr Cable added that the only alternative to nationalisation was to close the bank down and that he was confident Mr Cameron would back his calls for the temporary measure. The debate comes ahead of a meeting between Mr Cameron and banks and building societies at which he will ask them to do more to help householders avoid repossession when they come to the end of their fixed rate mortgages. He will urge the Council of Mortgage Lenders to use a gradual, tapered increase in repayments, rather than imposing a sudden rise. It could also involve providing financial advice to borrowers in times of difficulty or enabling them to switch to interest-only mortgages for a short period. Mr Cable told the BBC's Sunday AM programme: "The government should be getting the banks together and preparing some kind of safety net arrangement so that people are not repossessed, they stay in their home, they share their equity with the bank." Northern Rock chairman Brian Sanderson said no action would be taken to resolve the bank's plight "this side of Christmas". The bank's board has been talking to a number of potential buyers including a group led by Sir Richard Branson's Virgin Group, which has been named preferred bidder. Another contender, the Olivant investment group led by former Abbey boss Luqman Arnold, unveiled details of its proposed offer for the bank last week. It includes immediately paying back up to £15bn of the Bank of England's money that has propped up Northern Rock since September when the global credit-crunch plunged the firm into crisis. The Treasury had come under fire for not deciding on a rescue plan quickly enough. 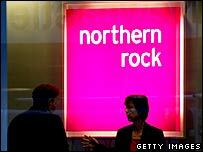 Should troubled bank Northern Rock be nationalised? Q&A: What next for the Rock?